Every lazy weekend deserves a lazy roast dinner – this week 6 hour slow roast shoulder of pork with dauphinoise potatoes and green beans. This is possibly the ultimate lazy roast, a beginner’s roast if you will. The reason it makes such a good beginners roast is due to the fact that there are only 3 components to get right and I can vouch that the slow cooking method is very forgiving with the timings. This was particularly helpful when I ended up having an impromptu mid afternoon nap. Ma bad. Again. Pour boiling water over the pork skin, and then pat dry with kitchen towel. This helps to open up the scores, which makes for wonderful crackling. Rub salt into the scores. Pop in the oven for 30 minutes until the skin has all browned and puffed up. Put a double layer of tinfoil over the top of the roast and then turn the oven down to 160 degrees. Cook for 5 and half hours. It does help it if you baste it with the rendered fat every so often, maybe every hour or so. Depending how fatty your joint is you may want to take the crackling off the joint about 30 minutes before the end of cooking; roasting it separately fatty side up allows it to get really crispy. 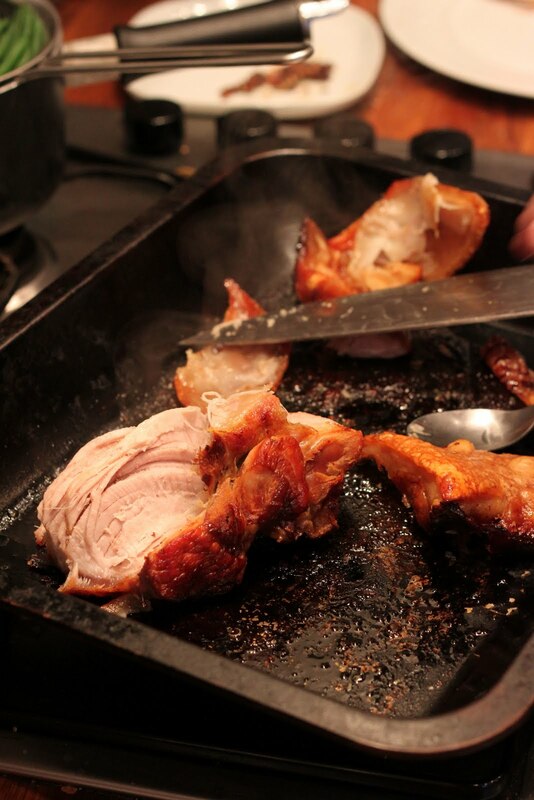 When it is ready the pork should be able to be pulled apart, all succulent and lovely. No need to rest this joint, which is just as well as it hard to resist. Mix all the other ingredients in a mixing jug and pour over the potatoes. Cook in the oven at about 160 degrees celsius for 1hr and 15 minutes. Mine were in for an hour and a half a got a little burnt. Check the potatoes after 15 minutes, if the oven is too hot the cream can split, adjust the temperature as necessary. After an hour check it isn't looking too burnt, it may need a tinfoil hat. yuuuuuuuuuuuuuum! whats a stroke of nutmeg?! This looks so good! Could eat a roast in any weather, at any month of the year. Great blog, love the photos and recipes. Doing this today! Thank you.